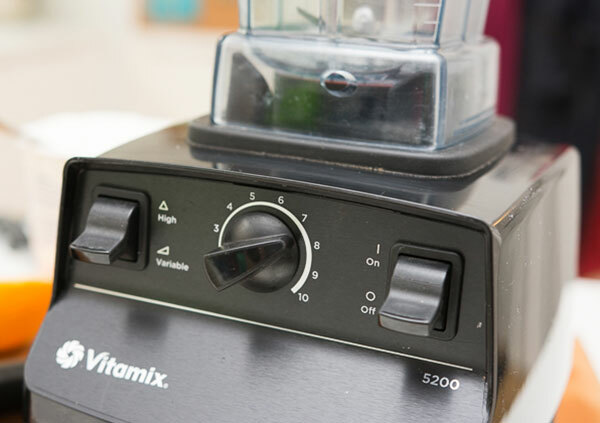 When most people are in the market for a high speed blender, the two top American brands most frequently considered are the Vitamix blender and the Blendtec. 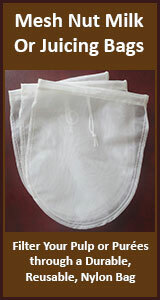 You will most likely find yourself comparing these two well-known varieties before making your final purchasing decision. While both have the horsepower to blend or powder the toughest of food items, choosing one from the other is a debatable topic. In many ways it really just comes down to personal taste and user preference. Do you want a Mercedes or a BMW? We have owned and operated both the Blendtec and Vitamix. 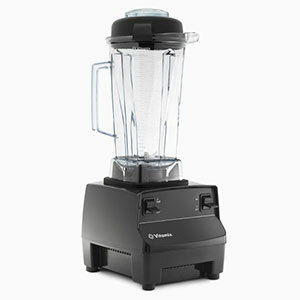 For over 10 years we had a Vitamix TurboBlend which we thoroughly enjoyed as our main blending device. As a secondary travel blender, we purchased the Blendtec which was at the time a more compact option. We can tell you first hand, they are both powerful blenders! In comparison to the Blendtec product line, Vitamix currently offers 11 more styles for home use. 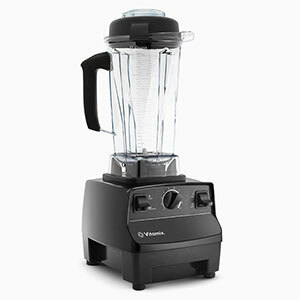 Vitamix has also expanded quite a bit since the days of the 2-speed TurboBlend, now offering many different upgraded selections and "low-profile" container alternatives. Here on this page we will give you a bit more about this particular manufacturer and all of their blender models available as of 2016. The Vita-Mix Corporation, owned by the Barnard family since 1921, officially began making blenders in 1937. Blendtec Inc. was founded in 1975, which gives Vitamix almost 40 years more experience in the blender-making world. We still remember some of these original blending appliances with containers made from stainless steel. Back in the 1990's, they were very popular among herbalists who used them primarily for powdering herbs and macerating roots for tincture-making. Since this time, however, they have become one of the most popular varieties found in American households and on counter-tops around the world. 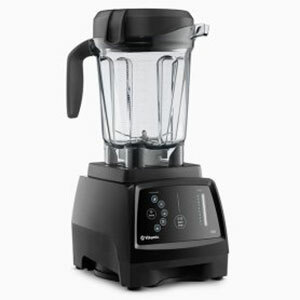 Today, they are common kitchen appliances frequently utilized as part of a health promoting diet and lifestyle, following the original mission statement proposed by the Vita-Mix Corp.
High speed blenders are essential appliances to own when blended drinks and meals have become a frequent part of your daily meal plan. Whether in the form of a green smoothie, protein shake or raw energy soup, these devices provide a concentrated amount of nutrients in one quick predigested 8-ounce beverage. They come in handy when making an assortment of pâtés, dressings, sauces, desserts or likewise when preparing nut milks and certain foods for the dehydrator. You can even use these units as alternatives to juicers as they completely purée all fruits and vegetables, which can be further strained using a nut milk bag. The Vitamix blender comes in a variety of household models depending on one's budget and blending needs. To date, as of 2016, these are the current selections sold from the Vitamix company, although older models may still be available from some retailers. Each blender comes with the motor base, shatter-proof polycarbonate container with vented lid, a cookbook, a getting started guide, a DVD and a tamper. 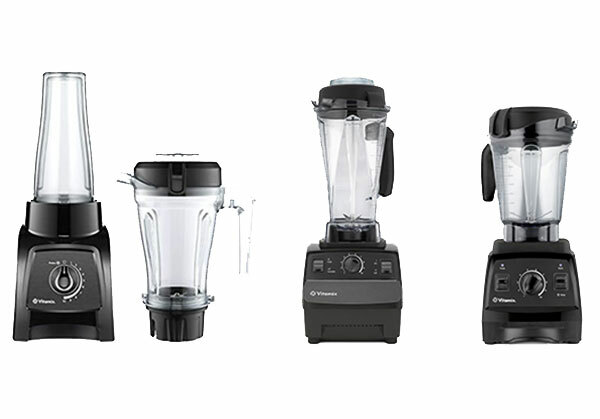 Vitamix offers full 5 to 7-year warranty's, which cover all parts, performance, labor and two-way shipping if needed. They also give you the option to extend the warranty another 3 years for an additional $75. C-Series: Classic Blenders - The C-Series is one of the original Vitamix body styles and now offers a variety of control options and container sizes. You can choose from simple high/low controls, a variable speed control or more convenient pre-programmed settings. S-Series: Personal Blenders - These are basically small high-end "personal blenders" that come with both a single and double size container. They are essentially designed to provide a convenient, easy to store counter-top option for creating quick drinks, like shakes and smoothies. A similar concept to the Nutribullet or Tribest personal blenders, only using Vitamix's high-end motor. G-Series: Next Generation Blenders - The "Next Generation" are blenders with upgraded motors and modern designs that can easily fit under any counter-top shelving. They are slightly more expensive than the basic C-series and S-series blenders. 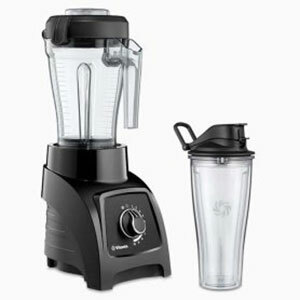 1) TurboBlend Two Speed ($399) - Simple high/low controls, 64-ounce container and a 5-year warranty. It comes in black only. 2) 5200 Standard ($449) - Variable speed control, 64-ounce container and a 7-year warranty. It comes in black, white, brushed stainless metal, grey and red. 3) Creations II ($449) - Variable speed control, 48-ounce container and 5-year warranty. It comes in black and white. 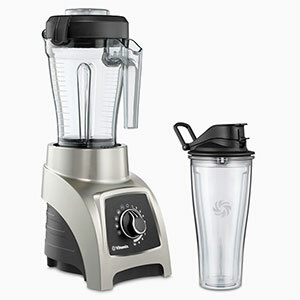 4) TurboBlend VS ($449) - Variable speed control, 64-ounce container and a 5-year warranty. It comes in black only. 5) Professional Series 200 with Compact Container ($479) - Variable speed control, 48-ounce container and a 7-year warranty. It comes in red only. 6) Professional Series 200 ($479) - Variable speed control, 64-ounce container and a 7-year warranty. It comes in black only. 7) CIA Professional Series ($498) - Variable speed control, 64-ounce container and a 7-year warranty. It comes in black, red, brushed stainless, grey and white. 8) CIA Professional Series with compact container ($529) - Variable speed control, 48-ounce container and a 7-year warranty. It comes in brushed stainless metal. Dimensions: 17.4 x 8.75 x 7.25 in. 9) Professional Series 500 ($559) - Variable speed control, 64-ounce container and a 7-year warranty. It comes in black only. 1) S30 ($399) - Variable speed control, two container sizes, a 20-ounce that becomes an instant travel cup with flip-top lid and a 40-ounce for small batches. It has a 5-year warranty and comes in black and red. 2) S50 ($419) - Two pre-programmed settings, variable speed control, two container sizes, a 20-ounce that becomes an instant travel cup with flip-top lid and a 40-ounce for small batches. It has a 5-year warranty and comes in brushed stainless metal. 3) S55 ($469) - Four pre-programmed settings, variable speed control, two container sizes, a 20-ounce that becomes an instant travel cup with flip-top lid and a 40-ounce for small batches. It has a 5-year warranty and comes in brushed stainless metal. 1) 7500 ($529) - Variable speed control, 64-ounce low-profile container and has a 7-year warranty. It comes in black, white and red. 2) Professional Series 300 ($559) - Variable speed control, 64-ounce low-profile container, a quieter motor and has a 7-year warranty. It comes in black and red. 3) Creations Elite ($557.50) - Ten variable speeds, a quieter motor, a 48-ounce container and a 5-year warranty. It comes in black only. 4) Professional Series 750 ($599) - Five pre-programmed settings, 64-ounce low-profile container and has a 7-year warranty. It comes in copper metal finish, brushed stainless metal and black. 5) 780 ($719) - Responsive LED glass touchscreen control panel, five pre-programmed settings, low-profile 64-ounce container and has a 7-year warranty. It comes in black and red. Containers - Made from shatter-proof polycarbonate and come with vented lid plug useful for tampers or when blending hot items. Blades - Four laser-cut, stainless-steel hammermill and cutting blades measuring 3-inch or 4-inch diameter to ensure consistent blending. Bonus Design Feature - Radial cooling fan and thermal protection system. 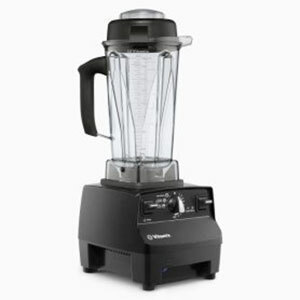 Manufactured in USA - All blenders are made in Ohio, where the Vita-Mix Corporation is located. Cords - Usually 6 ft on most models and 4 ft on S-Series blenders. Pulse Control - In addition to variable speeds, all blenders also have a pulse control option. Just like the Blendtec, Vitamix also offers the option to purchase certified reconditioned blenders for those on a budget. These are units that during a final factory inspection test had some kind of defect that required it to be recycled or "reconditioned." They are not units that were returned due to malfunctioning. Reconditioned machines are generally sold at about $100 less than the retailed price. They are also covered by a standard 5-year warranty with the option for an adding an extended 3 years for $75. 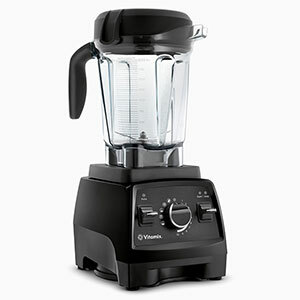 Quite Motors - Vitamix blenders have a quiet muffled rumbling sound when blending. This is one of its biggest advantages over the Blendtec units, which can be somewhat loud and ear piercing at higher speeds. Easy to Use - Most Vitamix models, with the exception of the new G-Series 780, are manually operated rather than digitally controlled. This feature can make them easier to operate over digital control panels. Attractive Appearance - The Vitamix has a slightly more attractive look, in our opinion, with rounded sleeker designs compared to the square and boxy look of the Blendtec. Tampers Come with Blenders - The tamper is a great tool to have for blending thick sauces, creams or purées, nut butters or foods that don't have a lot of liquid content. It is basically a long black plastic tool that fits inside the removal lid section. They come in three different sizes: classic, low-profile and mini, depending on the type of blender you purchase. Personal Blenders - Vitamix, unlike Blendtec, offers simple modern single or double serving size blenders ideal for making morning smoothies or recipes. These are the S-Series blenders. They are a high powered version of blenders like the NutriBullet. PayPal Credit Options - The company provides convenient payment plans through PayPal Credit. Currently there are two alternatives, a 12 or 18 month plan. However, if the purchase balance isn't paid in full within the selected term, 19.99% interest will be charged on any remaining balance. These are only available with a purchase of over $300.